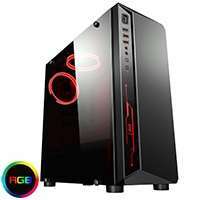 Web-Systems AMD Ryzen 3 X Pre Built Ready Gaming PC is the perfect off the shelf weapon! As it’s name suggests we have these pre built on the shelf ready to go in a heart beat, what more could you want. Hand built by our highly qualified experienced technicians (who are gamers too). With rigorous quality testing and inspection carried out rest assured you’ll have the most fine tuned gaming weapon at your disposal. Take advantage of this masterpiece now with our spring sale. No need to hold back save your hard earned cash to spend on those games you’ve always wanted to play. Want to purchase a Gaming PC but not sure where to begin? We offer a free instore 15 minute consultation for all customers who wish to discuss building their dream PC.You will have the opportunity to discuss and build in detail with our dedicated team of gamers, sales staff and technicians. Every precaution is taken to ensure that the options offered to you are all compatible. However, due to large number of options available, there can sometimes be compatibility mistakes. If this occurs, we we will contact you immediately with alternative options. This may cause a slight delay to your order.